Continuing from our part 1 on doing business in Dubai, let’s take a closer look at the different cultures working side by side in Dubai. But let’s make it a bit more specific and map out the differences following more or less the first four dimensions of Professor Geert Hofstede. In the table below you can see the differences on the first four culture dimensions (Hierarchy, We versus I or Individualism, Process versus Goals or Masculinity, and Anxiety Avoidance). If you want to read more on these dimensions, click here. Anything more than 10 points difference is something that you will notice as being “different“. Let’s look at each dimension and see what some of the impact can be on doing business and working in Dubai. As you can see the UK scores relatively low on hierarchy compared to all the other cultures, they are also the most Individualistic. The notion of equality in business and private life as the Western European know it is not common in all other cultures in Dubai. In terms of doing business in Dubai, it is important to realize that a paternalistic management style works better than a consultative management style. Opposing your boss directly is something that is not done in the UAE, India, Pakistan or the Philipines. 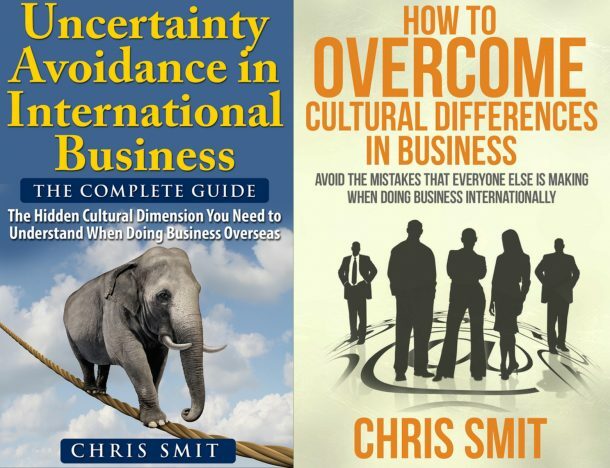 You might complain about your boss in those cultures, but not directly in his face. To a Western European it might come across as barking orders when an Indian manager commands another Indian or Pakistani. However, this is not the case. It is simply done this way. The fact that the Emirates score relatively collectivistic expresses itself in the fact that they own most of the businesses and/or are in the top positions of (bigger) organisations. This does not mean that they don’t work. It is just more accepted that others work for you, or you can command others to do work for you. 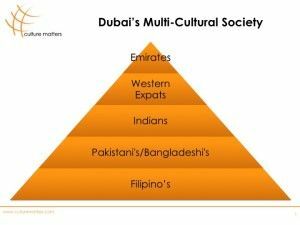 All cultures in Dubai, except the Western expats, have so-called in-groups. In other words, if you’re part of this group, you’re not part of the other group. For example, if you’re an Indian, you’re not part of the Pakistani circle. But also, if you’re an Indian from West-Bengal, you might not mix with the group Indians from Punjab. This doesn’t mean that people can’t work together. It is just that the importance of the group and belonging to a group is more important than the individual, as it is in the UK. 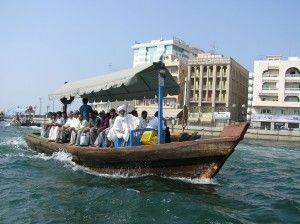 The cultural differences when doing business in Dubai are the least on this cultural dimension. All cultures mentioned in the pyramid score more or less equal. This is by far the most difficult dimension to understand when it comes to cultural differences. It often leads to a lot of confusion, because high-scoring cultures should have a lot of rules while the observable experience often displays the contrary. For that reason, I have even written a book on the dimension. You can get it here. Otherwise, you can read a post here and here. Or listen to the specific podcast on this dimension. When it comes to the management style of doing business in Dubai, being specific towards Emirates and Pakistani’s is important. While a more unstructured approach will work in the UK, India and the Philipines. High scoring cultures will appreciate more detail and structure than lower scoring cultures. In the descriptions above I have tried to illustrate just a couple of cultural differences and haven’t gone into great detail. And as we all know, the devil is in the details and when it comes to cultural differences often the subtle details will cause the friction when working together. But as Dubai has shown, working together in the multi-cultural metropolis is very well possible. If you’re working in Dubai or plan on doing business there you might want to follow a specific workshop covering the cultural differences. Find out more by clicking here. I’m curious to hear your experiences and questions are always welcome. I liked your article, especially how you combined the various factors. I am not doing business in Dubai yet, therefore your view provided me with a good initial insight. If ever you need more information about doing business in the UAE, let me know.